What is more elegant and unusual than a clutch that gracefully flows with Glimmering Swarovski crystals and tiny nuggets of Garnet. This is the one for your special evenings out. All crsytals and garnets are handset. There is a hidden sterling silver chain. 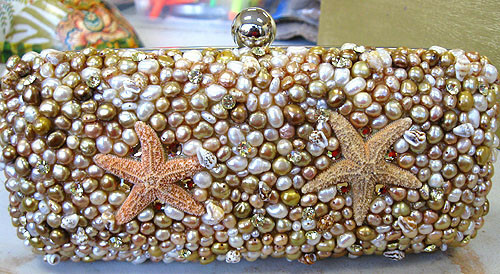 This handbag measures 8" x 3"
We love freshwater pearls. 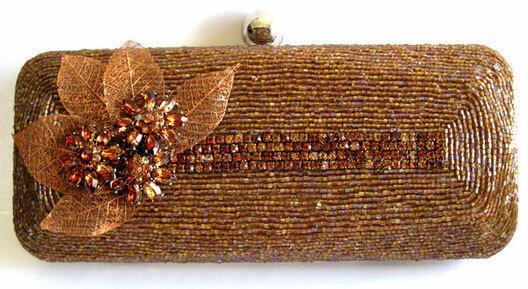 In this clutch we used flesh and light copper pearls to create this fresh summer clutch. We used real tiny seashells and natural starfish. We used soft Jonquil (light yellow) and inserted them at random points that help give this clutch a very three dimensional effect. Includes a detachable chain. It measures 8" X 3". 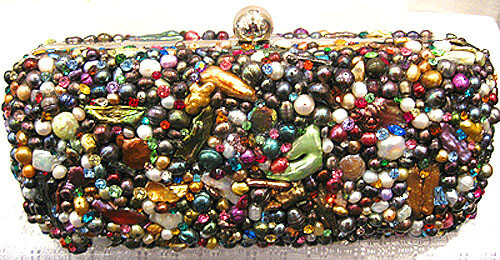 VC111 -This clutch or minaudiere is entirely covered in freshwater pearls and Swarovski crystals. The pearls are handset on the base so that they create a solid pearl purse. The pointback crystals are handset into the pearls to create a seamless effect. This handbag measures 8" x 3"
In this clutch we capture the essence of fall. The rich fall color of the leaves are shades of deep red/orange, golden yellow and green. 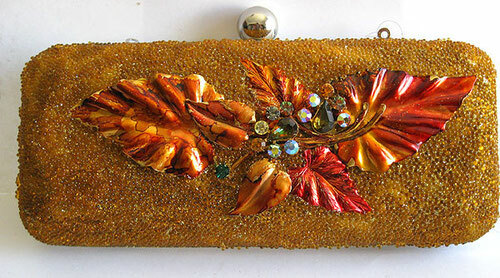 Tiny glass beads float on this bag and we used a natural brass leaf to give it a three dimensional effect. Two fall colored crystals complete this bag. Comes with detachable chain. 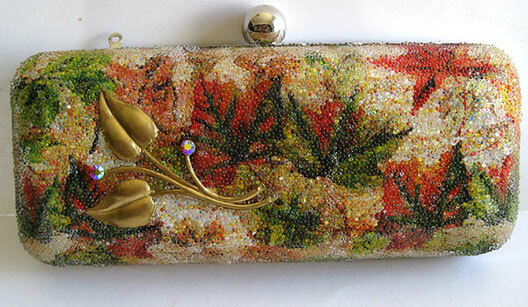 Measures 8" x 3"
On this clutch we took tiny 3-cut seed beads and covered the whole clutch. We added 4 rows of copper/brown Swarovski crystal chain in the center and set the entire bag off with three Copper /Brown crystal findings and five bronze lifelike leaves. This one is simple and elegant. Measures 8" X 3" and comes with detachable chain. 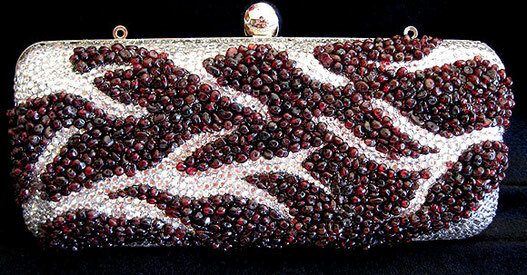 VC113 -This clutch or minaudiere is a combination of silver lined bugle beads along the side. The center is filled with a variety of differnt shapes and colors of Swarovski crystals. This one is simply stunning and will coordinate with any outfit for a night out on the town This handbag measures 8" x 3"
Tiny topaz glass beads cover this clutch. We added brass leaves in different sizes and used a torch to turn them into different shades of browns. The center broach with Aurora Borelias crystals in different hues complete the clutch. Detachable chain included. 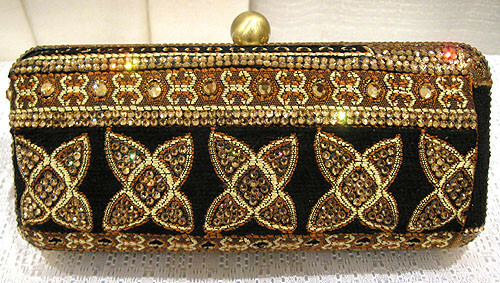 Measures 8" x 3"
VC111 -This clutch or minaudiere is covered with a tapestry fabric and accented with Swarovski crystals. It gives the bag a rich texture so that it is truely thre dimensional. The crystals are handset into the petals on the design and the entire frame is entirely crystalized. 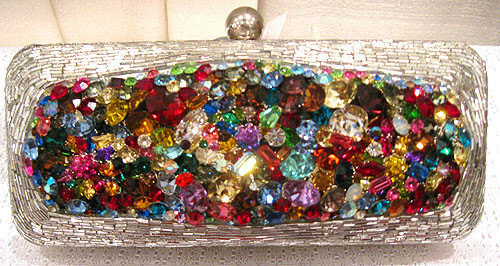 The pointback crystals are This handbag measures 8" x 3".